Idan is Software engineer with experience in Server side technologies. Idan is responsible for various infrastructure models in the software industry(Telecommunications, Finance). Part of a system I am currently working on is manipulating raw data. The data being sent from multiple client devices (Android/Iphone devices, etc..) ~ 100,000 requests per day. The raw data needs to be collected and ready for later use. It gotta be searchable and aggregated for calculations. I had little experience with Solr but this time I wanted to try ElasticSearch(ES). I read about ES out of the box clustering and shards capabilities so I gave it a shot. The installation is simple and quick. ES ships with comfortable UI dashboard(Marvel) and a command line tool to execute queries. After playing with the framework I created my first Index and Mapping types (MyIndex, MyType). I didn`t know at that point how exactly my data was going to be structured, so I went into “all-fields-querying’. Meaning that for a single input searching the ES engine will go through all documents and search in each document’s field. The matching documents will return. We may achieve this by using the field _all. That field includes flatten text of one or more other fields within the document indexed. The field is populated by default (if enabled). "_all": "Android Galaxy S5 device"
ES dashboard also ships with a tool called Sense. With this tool you can Index and execute queries straight into ES without using any client (It’s good for testing and developing purposes). So after playing with ES I decided to write the server side layer to be as my ES facade. My intention was to write simple client with a single search line that will send requests to the ES via the server layer and render the results to the screen. NodeJS is single threaded that implemented with event looper. Therefore the “heavy” logic needs to be asynchronously executed. I am using Q in my code. This way I can “free” the event looper and create the asynchronous requests to my ES engine and get clean callbacks through the code layers using Q. After a while I found the need of having extensive API. I used ExpressJS for this purpose. I wanted MVC framework to provide a rest-api-like layer that will handle all API requests in my server side(NodjeJS). I went to ExpressJS which appears to be the most popular web framework for Node.js among web developers (We as experienced open-source developers know that community matters!). 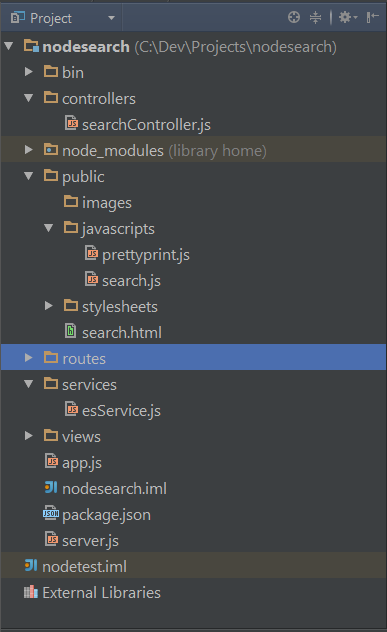 So after playing with the framework I found out that with Yeoman and generator-express you quickly generate project structure of Nodejs including all necessary expressJS libraries to get you going. The controller invoking the perfomSearch method using esService and returning the results back to the JS client asynchronously using promises. Reference: My Exprience using ElasticSearch NodeJS and ExpressJS from our JCG partner Idan Fridman at the IdanFridman.com blog. 2 Comments Views Tweet it! first of all thank you for your post! Do you have a Github repository with the sample code?